You rock! At times you make me feel as though you know me personally when teaching. Thanks! ….If people do some research on line (like I did) they would realize that your program is “The Best” there is….. More power to you Nita, your family should be very proud of you. I am so satisfied that you can post what ever I wrote and use it in your blog or advertising in any shape or form you need it. You have my blessing and authorization. You make me proud, as a woman. I Love your style of teaching. Your videos are very informative….. …I am deep into learning. I want to listen every word you say and watch every cut you make. Your skills are great. …I am learning a lot from you so unofficially you can call me your student. One day I will make you proud from this part of the world. ” I am so surprised at how easy you make it look. I always think I couldn’t do that then I listen to you and suddenly it all seems so easy. I live in England, so i have been finding it hard to find carving help and tools, i have wasted much cash and time buying books that don’t help much and buying tools that don’t really do the job. Then i stumbled on your site and took a look at one of your free lessons, i was skeptical at first, thinking that this was just another money making site out to get your cash, but the more i watched the more i realised this was not the case. Your advice is fantastic, its at the perfect pace, i have bought your lessons and i love them, they are so helpful, when you are teaching us how to do something, you also point out what mistakes people who are learning make, and yes before i watched your lessons i made them all. Your videos have saved me so much learning time and my skills have increased so much i could just give you a big hug to say thanks. all the products you recommend do the job, and one good thing is you tell us the reasons why you recommend them. if i had found your tools first i would have saved hundreds of pounds. So once again Nita a big thank you and keep those lessons coming.i give full permission if you want to use any part of this as a testimonial to your fantastic work. “I made this today and it turned out so wonderful I just had to share!! I only started “carving” around November, and let me just say that had I not stumbled across your web site this would have never been possible!! I have learned SO MUCH from your site and lessons. I really appreciate the information you offer that is so hard to find anywhere else! I live in rural West Virginia and the internet is my only resource to learn anything, and the majority of what I have learned has been from you. I love your work and your educational DVD’s. I have a lot to thank you for teaching me!…. Can u tell I love your work and videos? These are thanks to you”. 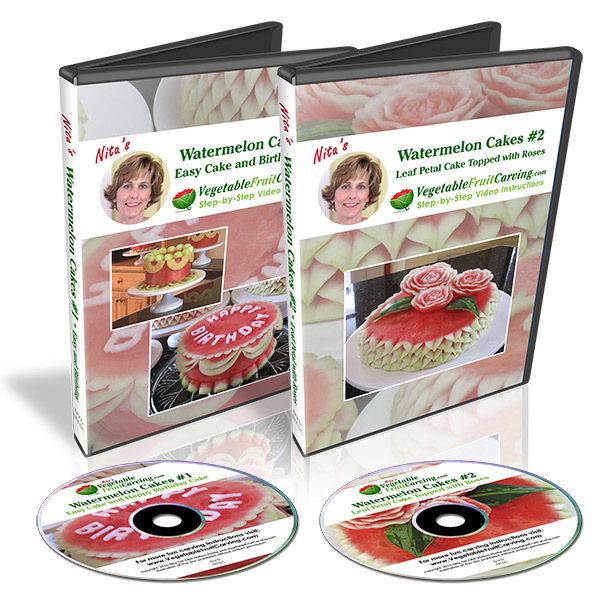 “Not only did I thoroughly enjoy the video lesson, applying what I learned the very next day; but was overwhelmed by the response of my family when I took two of my first creations to our Christmas party last night! Everyone was amazed!! They couldn’t believe that the roses were made from Turnips and Beets!! The cameras were flashing all night! 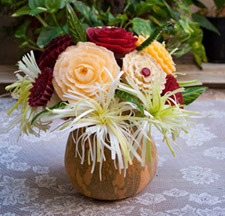 I can tell you I had a ball creating the beautiful roses and making the fabulous arrangement. Anyway, just a report from one satisfied student (I don’t consider myself just a customer)! 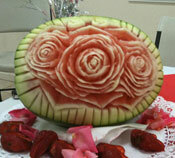 This was my first rose watermelon carving. Thank you for teaching me how to do it. Hope you like it! Thank you for your lessons. I have been carving for some time now. However, since I got your lessons I get more ideas and it is easier to carve when you learn some techniques. It is more fun now. I absolutely love the lessons and ideas. “My wife Susana and me are over the moon. I can’t believe my little effort could be so rewarding. Now I am more excited and motivated to go to the next level. “I love that you go through making common mistakes because I usually find that people who are experienced in a skill area forget the basics. But you make the student feel like you understand the level they are at and you are there to support them”. I am so glad that I ordered your DVD. It is the easiest one I have tried so far. I could see clearly how you cut the veg. I have already made an arrangement made from turnips and beets. My family was so proud of me. I am looking forward to other lessons. favorites. It was a big hit at the wedding in my back yard. I want to tell you a story. When I bring some stuff I practiced to my school and showed for everybody just like you said. I start to hear : ohh…ahh…I just smile and say in my mind ‘thanks to Nita, I am so proud about my skill. You are a good teacher”. I spent my last 2 hours watching my lessons on your web site . Thank you so much, every thing was really very clearly, your method is wonderfull !!! You can see my first watermelons here. “ THANK AGAIN NITA YOUR VIDEO IS SO EASY TO UNDERSTAND .MY COUSIN HAS A HER BABY SHOWER ON NOVEMBER 20 OF 2010 AN SO EXCITED. 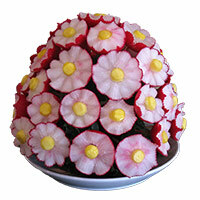 I WILL LIKE TO MADE RADISH FLOWERS BOUQUET FOR CENTERPIECES, LEEK FLOWERS AND ROSES USING TURNIPS AND BEETS. I CAN’T WAIT BECUASE THIS IS A LITTLE SURPRISE FOR HER. 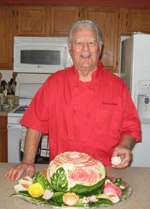 Nita, I love to receive your emails and instructions on fruit and vegetable carving…I have forwarded these to the chef that provides Monday night meals for us at our senior apartments…everyone enjoys seeing his (your) creations! Keep them coming! I made the bunny baskets, very simple, and took them to two events on Easter weekend and they were the hit of the parties! Then I tried a watermelon rose. It took more concentration than the baskets but I was surprised at how well it turned out. 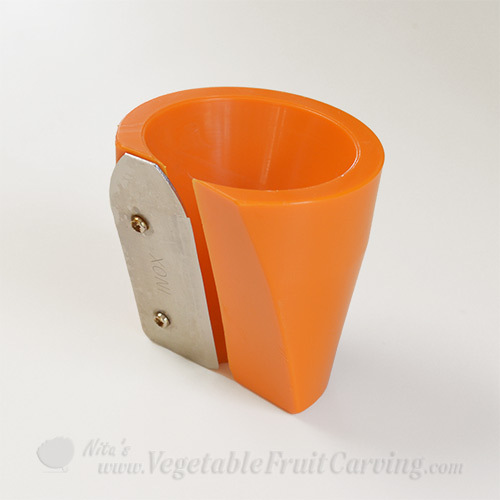 Today I bought a floral ring to try another watermelon, this time with the corrugated tools. What fun! 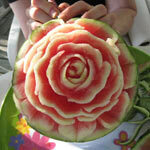 Nita, you present the information in a pleasant and relaxing manner which makes learning carving a creative adventure. See you on your own TV show soon! All in all I loved the video. I hope to see more in the future. 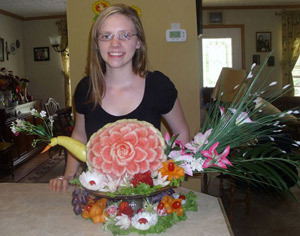 Upon receiving the hearts and roses DVD, I became more interested in Thai carving, So my mother and I were asked to do a dinner for 200 people and I carved some small round watermelon and cantalope flowers and put them by my chocolate fountain dessert table, and everyone was amazed at my work, and I told them I was in the process of learning from a lady, Nita Gill, out of California. I did send Nita pictures of more carvings I did for work and only used a paring knife. With the right tools and time, I will become even more better. Thanks Nita for sharing your gift. “My cousin had her engagement party last weekend and so my mum and I decided to be adventurous and give it a try. I made the radish flower bouquet and also the leek flower thing. 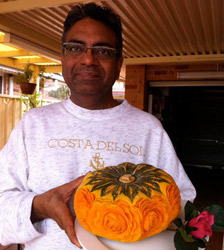 My mum did the rose carving using turnips and beetroot. I must admit when I started the radish – they did not look as good as yours, however, when I arranged all of it into a bouquet using a potatoe and lettuce leaves to cover the base – it really looked great! As for the leek – that was a winner and so simple to do. 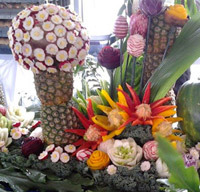 But I really enjoyed the finished product – it raised a lot attention especially at the hall where all the displays where placed in front main table. My cousin took photo’s of each centrepiece . 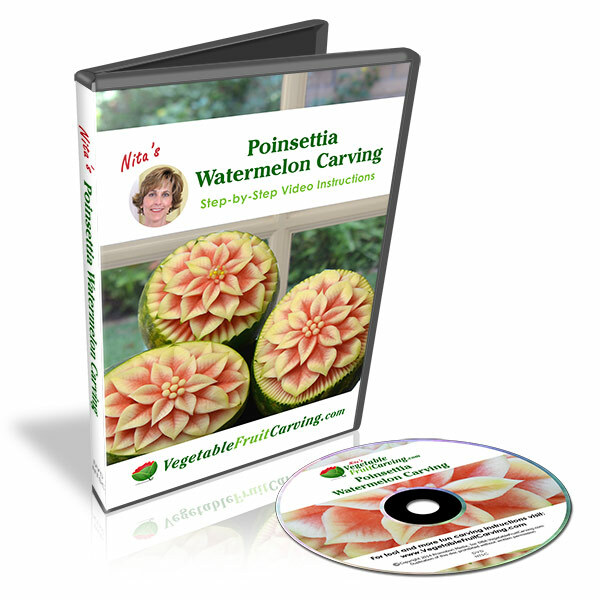 “My mother has really taken this to to a new level – she is carving any fruits and veggies that she comes across and really enjoys doing this – I am so glad i came across your DVD as it has in effect given my mum the foundation on which to practise her different ideas on. So once again many thanks, and I look forward to your next DVD. i just checked out the video sent by you n lemme tell you i am a student pursuing hotel management,so have a bit knowledge about these thingz. I have enjoyed watching your DVD all day, and even more impressed with your talent. In the past, I’ve looked at several Asian/Thai web sites and their art, and while they are beautiful in their own style, I much prefer your approach. 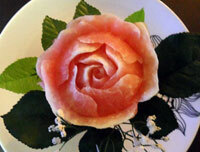 Thank you for sending me your free video on making radish flowers. It was so simple with the right tools. Who knew?! Let me know when your next lessons are ready. Easy to follow and great camera work. Be very proud of what you do, and thanks for sharing your knowledge with others. You did a great job of explaining what you were doing and WHY, which is very important. For instance, you explained that in making the first few cuts of the radish, you don’t go in too deep or the radish will crack. You also explained WHY the radishes need to be placed in ice water. It was also great that you dropped a radish from the “bouquet” and then said, “Sometimes things like that happen.” Good move leaving that in the video. It’s important. 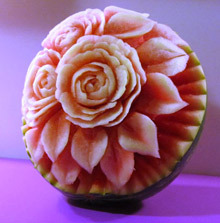 I had a special time carving my first melon with Nita. she is an exceptional teacher with patience, skill and artistic talent. I enjoyed my time learning from her. Its fun making art you can admire, then eat!! Get Started Now. Ohhs and Aaahs are guaranteed.